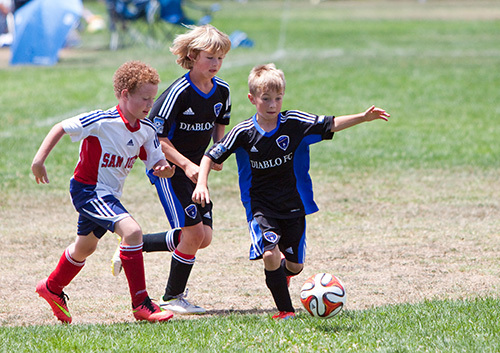 How can I protect my child's teeth during sports? Sports are great for children for a variety of reasons. Children can develop their motor skills, learn how to solve conflicts and work together, and develop their work ethics. As a parent, you may recognize the benefits of sports, but also naturally worry about your child’s health and safety. Your job goes beyond providing a water bottle and making sure your child follows the rules of the game. Although you may not think of your child’s teeth first when you think about sports, accidents can happen that affect your children’s teeth. A stray hockey stick, an errant basketball, or a misguided dive after a volleyball are examples of ways a child could lose a tooth. In fact, studies show that young athletes lose more than three million teeth each year. Becoming a better athlete involves refining skills, learning the rules of the game, and being a good sport. These components are not just about winning. They are also about safety. Young athletes who are better ball-handlers and who are careful to avoid fouls and penalties are less likely to have harmful contact with the ball, teammates, or opponents. Children who are better roller-bladers are less likely to take a face plant into the blacktop, and more likely to save their teeth. Being a good sport and avoiding unnecessary contact is one way to protect teeth. If your child is in a sport that poses a high threat to teeth, it is essential for your child to wear a mouthguard. Mouthguards fit your child’s mouth and consist of soft plastic. Dr. William Bozalis can custom fit a mouthguard if generic ones are uncomfortable. While children may resist wearing a mouthguard initially, your persistence in insisting that they wear it should be enough to convince them. A helmet or face mask provides additional protection. While prevention is best, rapid treatment can improve the situation if your child does happen to lose a tooth during sports. Rapid implantation can work in about ten percent of cases. To learn about ways to save a lost tooth, contact our Oklahoma City and Midwest City, OK office.